Having your chimney inspected and cleaned by professionals is not only a good idea, but it is a necessity to ensuring that the integrity of your home is maintained throughout every season. Failing to do so can result in a number of problems that pose incredible safety risks for you, your home, and your family. For this reason, in today’s article on chimney sweeping, we’ll be talking about a few of the most important reasons why you should have your chimney cleaned by the professionals at ELITE Chimney & Masonry. If you are located in Chicago, and you are in need of the best chimney sweeping services in your area, then don’t hesitate to reach out to our qualified team of experts at ELITE Chimney & Masonry. With countless years of experience under our belts, we are confident that you will be more than pleased with all that we have to offer. From chimney repair and rebuilds to chimney sweeping and gas line inspections, we do our best to ensure that we can exceed your needs in a timely and efficient manner. Learn about a few of the reasons why you should have your chimney cleaned today by our team at ELITE Chimney & Masonry! If your chimney is suffering from soot buildup, then there is a good chance that your fires aren’t burning as strongly as they could be. This is one of the best arguments for having your chimney cleaned yearly if you are looking to improve the amount of heat that your fires give off. Not to mention that with better airflow comes the reduction of smoke, leading to cleaner and more efficient fires being burnt throughout the year. It’s no secret that chimneys can sometimes cause fires if they are improperly cared for. However, many individuals are unaware of the sole reason behind most chimney fires. Creosote is a harmful substance that can accumulate on the inside of your chimney, while also posing serious health concerns. This toxic chemical is known to cause respiratory problems, leading to compromised health that can easily be remedied. This is one of the main reasons why we suggest having your chimney inspected and cleaned annually. If you plan on selling your home in the near future, then there is a good chance that the integrity of your chimney will come into question. Failing to keep your chimney clean could reduce the overall value of your home, resulting in receiving an offer on your house that may be less than your initial asking price. For this reason, you should consider getting in touch with our qualified team today to learn more! 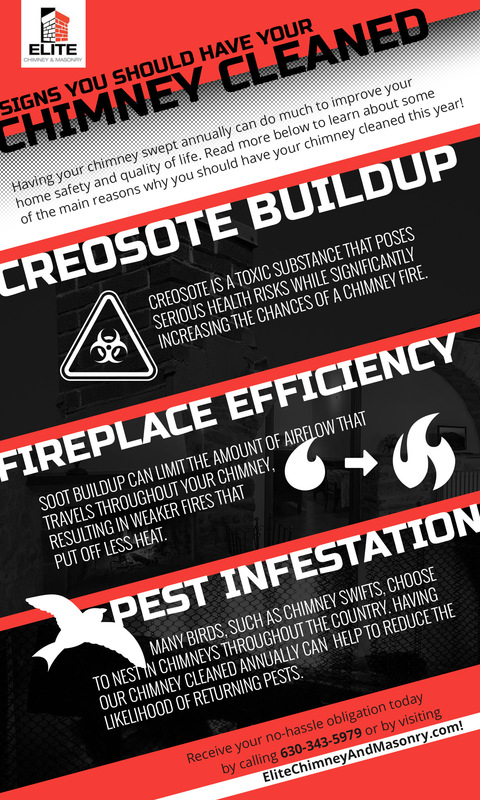 These are just some of the many reasons why you should consider keeping your chimney in pristine condition! If you are interested in learning about our entire offering of services, then consider completing the contact form located on our website. We work hard to ensure that all requests are responded to in a timely manner, and we look forward to speaking with you!